State revolving funds (SRFs) have been used for decades as a source of low-cost financing for a variety of water-infrastructure projects. For example, if a local public water system needs new storage tanks, is looking to implement a project to recapture stormwater, or requires funding for other gray infrastructure projects that help meet water quality standards, borrowers can apply for loans through a state’s Clean Water State Revolving Fund (CWSRF). Each state also has a Drinking Water State Revolving Fund (DWSRF) that works similarly to the CWSRF but is focused on financing safe drinking-water systems. While SRFs have conventionally been used to fund traditional graywater municipal-wastewater treatment and drinking-water projects like the ones above, SRFs can also serve as a finance source for nontraditional projects such as green infrastructure to control nonpoint source pollution (NPS) and protect source-water areas. Beyond expanding the scope of uses for SRF funds, states can also apply an emerging and innovative use of SRFs known as “sponsorship” that allows public, nonprofit and private entities access to financing necessary to implement land conservation and restoration projects that benefit local water quality. To date, all of these sponsorship programs—those which pair a traditional public water system with a nontraditional NGO or private partner to develop a green infrastructure project—have been accomplished through the CWSRF. As explained below, due to the large discretion given by the United States Environmental Protection Agency (EPA) to states in how they manage and use SRF funds, it is possible for states to use SRFs in a variety of ways that allow them to meet water-quality standards by investing in green infrastructure. Use of SRFs for investing in green infrastructure, while proven in some places, is still a new concept in conservation finance. Emerging finance tools may sometimes be controversial and require customization. They require time and consideration to ensure this use best meet the needs of a state. At its core, an SRF is a state-owned infrastructure bank that provides low-cost loans using federal funds. EPA provides states with capitalization grants to both clean water and drinking water SRFs, which are then matched with 20 percent additional funds from state sources. These federal grants are effectively leveraged double or triple in value when their impact on communities is measured dollar-for-dollar. For example, for each $1 of federal capitalization, $3 of assistance is provided to communities through the CWSRF. In 2017 alone, the CWSRF nationally received a $996-million federal capitalization grant that states matched to total nearly $1.3 billion dollars. States then added to this total and made loans for the amount of $7.6 billion. An estimated $120 billion dollars are currently revolving in the program. Traditionally, CWSRFs have been used to provide low-interest loans for “gray” infrastructure projects that address water-quality issues. These projects include constructing municipal wastewater facilities and building decentralized wastewater-treatment systems. In 2006, the California CWSRF approved a $25-million loan to help finance the acquisition of nearly 40,000 acres of redwood forest in Mendocino, CA. The Conservation Fund now manages the working forest for low-level, sustainable harvests. Its goal is to restore water quality in streams that were once full of salmon and other fish and are now recovering their productivity. In 2010, The Oregon CWSRF made a $3.8-million loan to the City of Cannon Beach to purchase and preserve 800 acres of land in order to protect water quality in Ecola Creek, West Fork Ecola Creek, and North Fork Ecola Creek. Within the broad framework set by federal legislation, especially the Clean Water Act and Safe Drinking Water Act, states have extensive flexibility to set their own priorities and manage their SRF programs. Therefore, there is broad variety in how states choose to manage programs and what restrictions they place on funding use. Barriers to Legal Implementation: Most states have used their discretion to restrict funding to only public agencies or publicly owned utilities. Other states have begun to broaden the definition of eligible borrowers to include private entities who may be able to provide NPS pollution-mitigation projects. States should refer to the legal frameworks that established their SRFs to review what limitations currently exist and consider potential policy changes to expand use of funds to meet their pollution-reduction goals. Demand for NPS Loans: Some states worry the demand for NPS-loan projects is not sufficient to justify this use of CWSRF funds. Adequate marketing and outreach to potential borrowers can help ensure they understand the benefit of this type of loan as a cost-effective mechanism for meeting regulatory requirements related to NPS pollution external to the CWSRF. 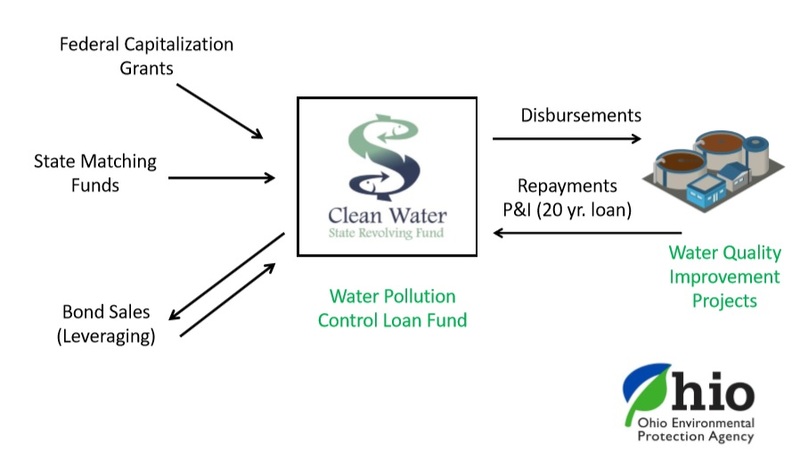 Revenue Source for Loan Repayment: A common barrier to increased CWSRF lending for NPS pollution abatement is the difficulty of identifying a dedicated revenue stream for repayment. Water utilities have rate payers to provide a repayment stream, but land conservation or restoration projects may not provide revenue streams compared to gray infrastructure projects. In some innovative cases, however, these projects can produce revenue through timber sales, carbon credits, or other nontraditional sources which would support repayment of the loan. As states continue to grapple with the issue of NPS, it is clear that among the many options to address NPS water issues such as dam removal, watershed restoration, green infrastructure, and land conservation, many are difficult to fund though traditional SRF loans because these types of projects do not always have clear sources of revenue to repay the original loans. To finance nontraditional water-infrastructure projects, some states have created a new type of program within their CWSRFs known as “sponsorship” programs. Through sponsorship, a municipal government, water utility, or other applicant applies for a loan for a traditional water-infrastructure project and increases the loan enough to sponsor a nontraditional project. For example, in Ohio, a borrower applying to the Water Resource Restoration Sponsorship Program (WRRSP) for wastewater-treatment loans can either propose its own watershed-restoration project or “sponsor” a third party - such as a land trust, park district, or other entity – in doing a watershed-protection or -restoration project. The CWSRF in turn reduces the interest rate for the loan so the utility has no net increase in cost but is able to finance the sponsored project. Through this mechanism, SRF loans are able to help municipalities address their pressing watershed restoration or protection priorities without placing a repayment responsibility directly onto the NPS projects. Determine Financial Capacity: Because the sponsorship model offers a discount in the form of lower interest or greater principal, the SRF should be sufficiently financially stable to absorb the cost of a sponsorship program. With this goal in mind, a state should create financial models to determine how much funding it can make available under the sponsorship program while still ensuring the long-term sustainability of the SRF. Assess the Legal and Regulatory Context: The state legislation that sets up each SRF outlines certain limits and rules regarding how its funds can be used. Therefore, states need to determine if they already have the authority to create a sponsorship program or if they need to modify legislation to do so. Considerations include the allowed uses of SRF funds, the requirements for who may receive funds under SRFs, and the guidelines about whether the states are able to adjust interest rates. Evaluate the Potential Projects: States should evaluate the green infrastructure-project pipeline and see what types of users might be best suited for sponsorship programs. In addition, states should consider what type of projects would improve NPS pollution, what the demand is, and whether the project types are permitted by existing regulation. For example, in Iowa, almost 90 percent of NPS pollution comes from the agricultural sector. A potential project assessment can help evaluate the long-term viability of a sponsorship program. Define the Program Criteria and Guidelines: As required by the Clean Water Act, states publish “Intended Use Plans” that outlines the criteria, guidelines and goals of state revolving funds. This same process would need to be completed for a sponsorship program following federal rules. Ohio’s SRF is the third largest in the country. Since its inception in 1989, Ohio’s SRF has distributed nearly $8 billion through nearly 3,000 loans. In 2000, the Ohio Environmental Protection Agency launched the WRRSP to treat NPS pollution. Jerry Rouch, assistant chief at the Office of Financial Assistance at the Ohio EPA said the existing SRF regulatory framework in Ohio at the time of creating the sponsorship program was broad enough to not require a legislative amendment. Of the current $900-million-dollar SRF program, $15 million goes to the WRRSP. Sponsorship projects are funded by advancing a portion of interest due on the long-term repayment of a loan when the original wastewater treatment loan is made. Protection of the Turkey Creek Estuary - Through funding from the Ohio Water Resource Restoration Sponsorship Program, Northeast Ohio Regional Sewer District (NEORSD) partnered with the Land Conservancy to preserve the 603-acre Turkey Creek Estuary with its Consolidation and Relief Sewer loan. The area is home to 400 native plant and animal species, 60 bird species, and other rare and threatened species. The site will be transferred to a local public entity that will manage it as a nature preserve and public park. Since 1988, Iowa’s State Revolving Fund has provided over $3.2 billion in loans. In 2009, Iowa 's Legislature amended the State Code to allow a new category of projects to address NPS water quality issues . This category is called “water resource restoration” sponsored projects. The projects can be financed with sewer revenues . Lee Wagner, program planner for the SRF Nonpoint Source Program at Iowa’s Department of Natural Resources, said that sponsorship’s in Iowa follow a 2-for-1 type of model: a utility borrows for both the wastewater-improvement project and for the sponsored project . Then, the overall interest rate on the total amount of principal borrowed is reduced so that the utility’s ratepayers do not pay any more than they would have for just the wastewater improvements. Iowa’s SRF is robust enough that it is able to afford $10 million in interest-rate reductions per year to fund sponsored projects (L. Wagner, personal communication). Iowa uses a bottom-up approach that allows municipalities to develop locally directed projects to fit their water-quality needs. In this model, a municipality with a wastewater-infrastructure project can sponsor a conservation project that addresses an NPS water-quality issue within the municipality. The issue may or may not be directly related to the infrastructure project. The borrower is responsible for the success and maintenance of the project either for the lifetime of the project or the life of the loan. Oak Savanna and Prairie Restoration - Through Iowa’s Water Resource Restoration Sponsored Project program, the cities of Ottumwa and Sioux City sponsored the restoration and creation of management plans for city-owned parks that had become overgrown with invasive and undesirable species. This restoration work and continued management will allow the existing native vegetation and dormant native seed to reestablish, increasing flora diversity. This vegetation results in improved soil health and stability, reduced runoff and erosion, and increased overall biodiversity. As NGOs and state and federal agencies explore emerging and innovative uses of nontraditional funding sources for land conservation, water quality, and other initiatives, policymakers and municipalities will need to consider how public and private resources can be layered to maximize impact while honoring the intent of the various funding sources. State revolving funds are already being used in a variety of ways to achieve state water quality targets and new ways will likely emerge. Cale-Finnegan, P. (2016). Investing in Iowa’s Watershed. Iowa Department of Natural Resources. Lyman, M. W., Meyer, S. R., & Lerner, J. (2017). The Potential for Using State Revolving Loan Funds to Finance Land Conservation in the New England States. Highstead Foundation. Ohio Environmental Protection Agency. (2018b). Water Resource Restoration Sponsor Program (WRRSP). Zieper, M., Shillinglaw, B., O’Connell, P., & Freeman, H. (2013). Financing Land Conservation with the Clean Water State Revolving Fund System. The Trust for Public Land. Acknowledgment: Jeff Lerner provided significant input during the research for this article. Note: Members of Conservation Finance Network’s steering committee are directly and indirectly involved in advancing the use of state revolving funds for conservation in multiple states. Staff from The Conservation Fund and Highstead Foundation reviewed this article. A correction to the date of a California SRF loan was posted on 5/29/2018.